It was SOOOO annoying to have diapers and wipes just floating around my already disheveled purse; it was even more frustrating when I had to use one of the diapers and found gum wrappers inside the puffy, unused diaper. So, I modified a MarthaStewart.com business card tutorial to fit my needs, and made a poopy clutch out of leather. I LOVE it and have it handy wherever I go. I had to make myself another poopy clutch (the old one was misplaced) and thought I could do much better than the tutorial/pattern I gave you last year. Without any further ado, I give you THREE versions of the old tutorial!! The new patterns are smaller and still fit up to 3 size 4 diapers plus a travel wipes case!! Very convenient for undercover diaper bags (aka purses). I mention below, you can also leather, vinyl or fused plastic. 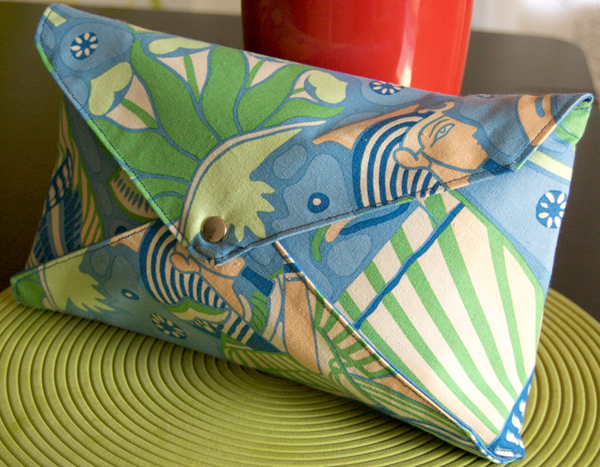 The folks at Etsy labs have a great tutorial on fusing plastic bags. I’ve seen some really cool fused bag projects. Similar to last year’s pattern, this pattern is optimized for leather, vinyl or fused plastic. No sewing required! This version is my personal favorite. It’s just like the first, it’s made for leather, vinyl or fused plastic, but with a decorative scalloped edge to add a little flirty flair to those messy diapering sessions. No sewing required. Can’t find leather or vinyl? Wanting to use up your ever-growing fabric stash?!? This pattern is for fabric, complete with instructions for two different edges. *Thanks SOOOO much, Jane Maynard, for linking to me on DesignMom!! *Also a big thanks to Tipnut for the link! Your diaper clutch is infinitely nicer than a Ziploc bag, which is always my container of first resort. A little thought and care enrich life greatly. Melissa I love looking at your blog, it’s inspiring. You have such a creative spirit. I think the next time I visit Maegan I would love to come and see you and your Penelope. I also want to look at how you made your diaper carrier. I’m not sure when I’ll get over to Menlo Park, my doctor has said that she thinks the baby is coming in June, and that could be anytime. But whenever it does happen I would love to visit you. of course you should begin posting these on Etsy.com I would totally buy one if I had a little baby of my own! I can’t believe I found your blog on here! I love your idea about the diaper clutch. So inventive! Hey! I just found your pattern and made my own! You are very talented and I enjoy seeing the other creative things you’ve done! Such a stylish clutch – you’ve done a beautiful job. Just discovered your blog via Design Mom – I’ll be back! My daughter-in-law is going to squeal with delight over the poopy clutch when she receives it as a Mother’s Day gag gift that isn’t really a ‘gag’ LOL Thanks so much for making our shopping trips a little more manageable with our toddler! Great idea! I think I’ll try making one out of oilcloth and use a polyresin snap. So cute, thanks for sharing! Great question. I feel a little silly that I haven’t addressed it in the tutorial. To be on the safe side, you’ll need about 24″ x 24″. If you’re afraid of cutting it too close when you’re out shopping for materials, print off the pattern and take it with you. Fabric will naturally require more material because it’s double sided and you need to plan for seam allowances. Hi! 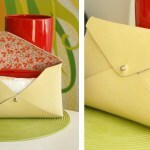 I found your clutch on pintrest the other day, and really want to make one of these for myself. So I went to tandy’s web site, and well, I’m a leather virgin and am at a total loss at what kind of leather to get. Chap? Deerskin? Garment? Pigskin? I really have no idea where to start. And I love the blue you used and was trying to find that also. Could you let me know exactly what kind/name of leather I should be getting? Thanks!!
? re: the fabric/sewn version… why does it say cut 2 of the outer fabric and 1 of the inner fabric? I am not understanding where/why you need a second outer fabric piece? sorry for the confusing instructions! i meant cut 2 of the outside fabric & cut 1 out of interfacing (fusable or sewn – i’ve used felt with great success). hopefully that makes better sense. i used the same fabric for the interior of the clutch as the exterior. but between those two interior & exterior parts that you sew together, you’ll need some structure or interfacing to make the clutch hold its shape. again, sorry for the misleading text. let me know if you have any other questions. i’m happy to help! I made a quilted version recently! Thanks so much for the pattern!!! It was a lot of fun to make! is held together by the snap, correct? There is no sewing other than sewing the pieces together and turning, then bring in the sides and connect with the snap? Hola estan padrisimas gracias por compartir tu idea! wow… your so so so creative. then i tried to make a scalloped edge.. i downloaded the tutorial and also the pattern. but i dont understand.. and cant use the pattern. I would be glad if you can tell me how. 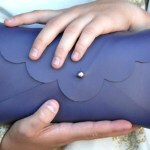 I love this clutch and I’m going to make some for expecting friends. My question is, in the original tutorial I believe you explained how to add fabric to the inside of the leather?? Would you mind explaining that process again? Theresa, You’ll get some ultra hold heat ‘n bond and iron one side onto the fabric of your choice. Then peel off the paper backing and iron the fabric onto the suede underside of the leather. Cut out the clutch and seal the edges with fray check. Hope that clarifies things for you!